This is a movie which has been on my mind for the past several months, and I’m not sure why. I watched this a bunch of times through high school, but I haven’t seen it since. It’s crazy that a movie like this is nearly twenty years old. I thought of movies from the 70s as being ‘old’ when I was in high school in the late 90s. Now, movies from my high school days must be equally ‘old’ to high school kids now. Man. I think I need to go lay down. 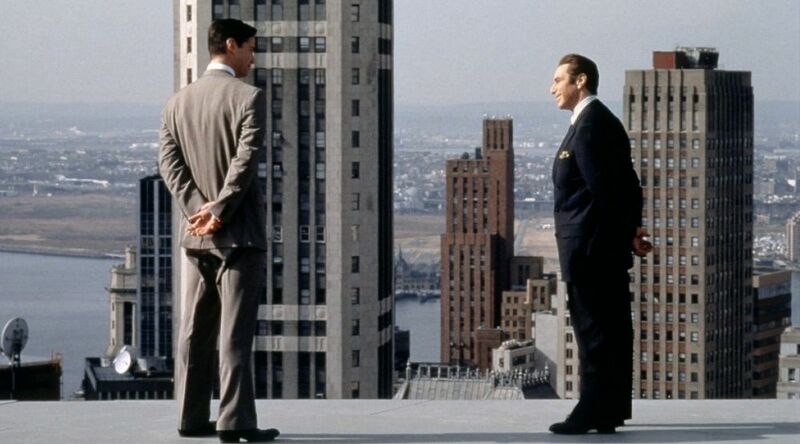 I watched THE DEVIL’S ADVOCATE (1997) on 8.18.15. It was probably my sixth or seventh viewing of the film, but my first in at least fifteen years. For some of the misses Al Pacino has had in his career, he did have a pretty good string in the 90s. THE DEVIL’S ADVOCATE may not be the movie people go to when they think of Pacino (nor should they necessarily), but it is a pretty good little flick. Pacino plays John Milton (an obvious homage), and we realize pretty quickly that he is the devil. He recruits a young lawyer from Florida, Kevin Lomax (Kenau Reeves) who brings his pretty young wife Mary Ann (Charlize Theron) with him to New York City. Lomax is a good guy who gets caught up in doing anything necessary to win a case. Milton seems to be a mentor, but the audience knows (thanks to the title of the film) that his true intentions are much more evil. Reeves has one of the best turns in his career, here. He is likable even as his character makes some terrible choices. That is a key for his film. If his Lomax is loathsome, we end up rooting for the villain. And the villain here is nuanced, often offering plenty of outs along the way. It truly is through the actions of Lomax himself that all the problems in the film are derived. He has the power – the free will – to solve them. He makes weak choices which preclude that possibility. Theron is good too, showing a wide range of emotion. She has the unenviable task of being both right and pitiful. Her character devolves into madness even as her husband is too blind – and too busy – to believe her. The script is really fun. The twist from act one to act two occurs relatively late, and it happens with seemingly minor characters in a dressing room. This movie does go demonic, but it takes its time getting there. Reportedly, early drafts of this script were more action oriented. The version we get is much more considered, much more a drama. This is a courtroom film combined with fantasy. It is not a common genre, to be sure, but the strength of the film is in how seriously it takes all its components. The filmmaking leaves some on the table. It tries maybe too hard not to tip its hand in terms of visuals when the script and acting are so obviously )and appropriately) tipping their hand to the ‘secrets’ of the film. A walk with Milton and Lomax through Chinatown ends with Milton talking about how he only travels undergournd via the subway, and he stands in front of a building’s giant street number proclaiming ‘555’ as if ‘666’ was way too obvious, but there had to be some sort of reference to the satanic. The filmmaking just doesn’t inspire, though the themes and concepts within the film itself make up for ho-hum direction by Taylor Hackford. But, regardless, THE DEVIL’S ADVOCATE is really good and really likable. I’m sure the ending annoys some, but it really does work in the context here. Having not seen the movie in a good fifteen years I was glad to revisit it. It is one I am sure to come to again well before fifteen years is up. ~ by johnlink00 on August 19, 2015. Just watched this one again recently, still a pretty good movie. Nice of you to highlight Charlize Theron.